· Please note that there may be a slight discrepancy between size measurements and actual product. · The color of the item might appear slightly different because of different screen display settings. · In no event shall Fightech™ be liable for any direct, indirect, punitive, incidental, or consequential damages arising out of or associated with the use or misuse of the product featured. 100% AUTHENTIC Fightech Dust Mask! HELPS HEALTHY BREATHING - Replaceable active carbon filters isolate up to 99-percent of dust, pollen, fumes, heavy metal particles etc. 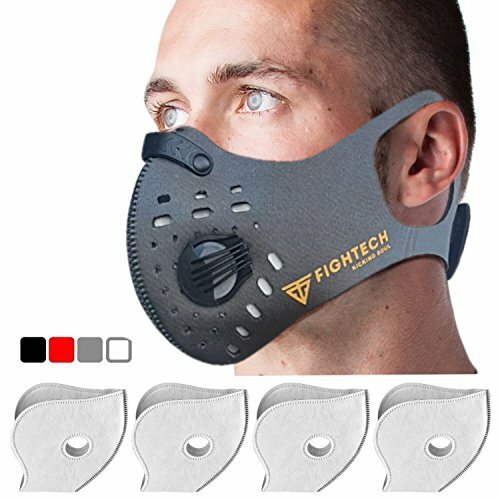 The Fightech mask will help you breath in a cleaner, healthier way. The uniquely designed filter valves may also increase the efficiency of your lung capacity training by helping to mimic high altitude/low oxygen level conditions. NEW AND IMPROVED EARLOOP DESIGN - The most common customer complain about previously designed dusk masks (mostly N95 masks) is that they slip off, making the respirator mask uncomfortable to wear. The new Earloop design - is our innovative upgrade that addresses this issue by preventing sliding. UNIVERSAL USAGE- The ability to filter pollution makes using the Fightech face mask truly universal. This dust respirator can be used to protect those working with harmful dust particles, vehicle exhaust and PM2.5, woodwork. It can also help filter allergenic pollens, as well as being the perfect companion for outdoor activities such as cycling, jogging, biking, hiking, and various snow sports. This air mask makes for true windproof, dustproof performance. COMFORT - Dual one-way valves allow easier exhaustion of heat and carbon dioxide, providing smooth breathing. Highly perforated and permeable, the ventilation system may enhance air flow. Made of elastic material, the size can be adjusted to meet most head types. The Fightech mask is always lightweight, adjustable and comfortable. Fightech mask filters and valves are fully interchangeable and reusable. This makes the mask easy to clean and last significantly longer than your average dust mask. If you have any questions about this product by FIGHTECH, contact us by completing and submitting the form below. If you are looking for a specif part number, please include it with your message. HOLIIBN Anti Pollution Smoke Mask with Exhaust Valve + 10 FILTERS, N95 N99 Carbon Activated, Air, Dust, Smoke Filter - Cotton Washable Respirator Breathing Mask with Adjustable Straps & Nose Bridge.